Blackinton B741-B Badge with Eagle and Applied Panels - B741-B - 2" x 3"
Home > Blackinton > Police Badges > Badges with Eagles > B741-B Badge with Eagle and Applied Panels - B741-B - 2" x 3"
B741-B Badge with Eagle and Applied Panels - B741-B - 2" x 3"
Take pride in knowing that the badge you wear is made by the best. Blackinton badges are made right here in the USA, and are tough enough to last no matter what the situation. This shield with eagle and applied panels measures 2" x 3" and features the eagle right in the design. 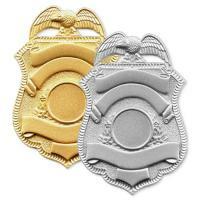 Customize your badge with choice of color, identifying inscription, clip type and seal. The Blackinton B741-B style badge, made for professionals by professionals. ©2002-2019 CopsPlus.com: Blackinton B741-B Badge with Eagle and Applied Panels - B741-B - 2" x 3"